On Wednesday April 7th, volunteers from the NSMBA assisted in coordinating a trail day for the High School Mountain Bike League. Staff from Metro Vancouver, students in the Cap U Outdoor Recreation Management Program, volunteers from the NSMBA trail team and of course the students, parents and teachers all made this day a great success. Work was completed on the Camp Brick/Richard Juryn, Hyannis and Blair Range courses. 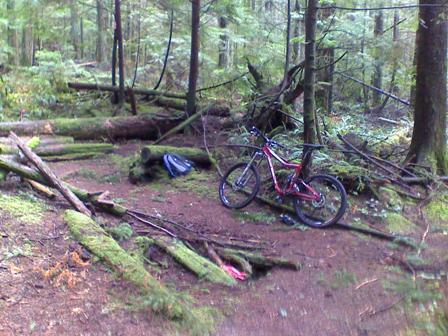 A parallel trail day was held on the Sunshine Coast by Ephinstone Secondary. The weather was terrible, but we were able to complete most of the work without sinking too deeply in the mud! We'd like to thank Wendy for wrangling up the high school crew, Heidi and the rest of the Metro Van staff for facilitating in Camp Brick/Richard Juryn, and Greig, Kris and Craig for bringing out the team from Cap U. Darryl and Randy from our trail team both volunteered extra time on a weekday afternoon to lead the crews at Hyannis. This day would not have been such a success without the dedicated efforts of these people. We were all working too hard to take any pictures of all the students happily working away in the pouring rain and mud, but read on for more details of the improvements, including before and after photos. If you want to see more work like this, make sure to join and donate to the NSMBA to show your support! 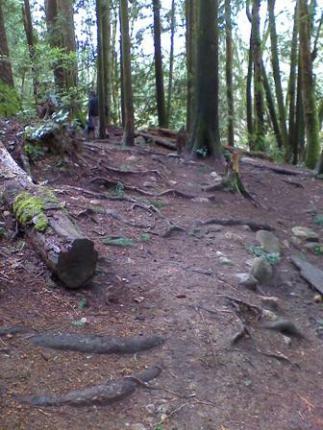 Students, parents and teachers from Balmoral and Sentinel were led by staff from Metro Vancouver and students from Cap U to fill in a number of chronically muddy spots along the Richard Juryn trail coming down from Camp Brick lookout. Rock boxes were constructed, and students hauled gravel and rocks up the trail to fill in these sections. 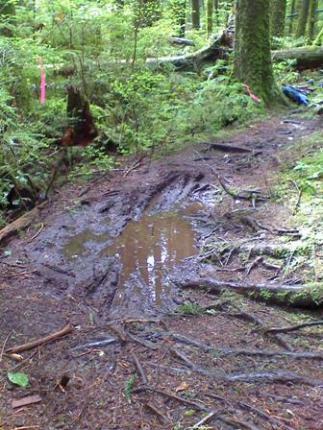 Hard work for sure, but now riders won't get bogged down in the mud or braid the trail. Seycove teamed up with the Cap U team and NSMBA volunteers to complete two projects at Hyannis. The first involved a chronically swamped corner that needed reconstruction to provide proper drainage. Our volunteers removed the muck, and resloped the corner with "gold" dirt. The second option was a roll down off of a log. 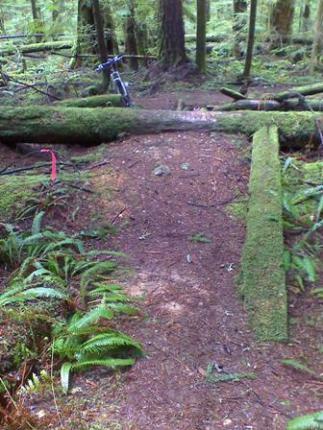 Volunteers reworked this section to give riders an option to launch safely by smoothing out the entry and filling in the hole in the landing. Rockridge, Argyle and Handsworth marched into the Blair Range course. 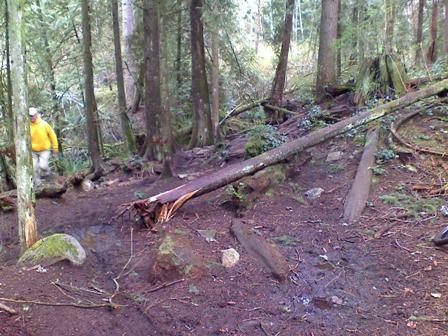 Here a fallen tree had forced riders and hikers to take the least desirable line. 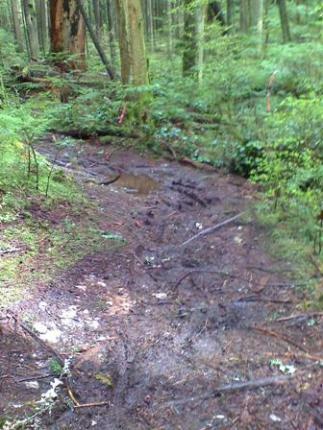 The "ride around" had turned into a swamp, and two young cedars were being damaged by traffic passing between them. We removed the fallen tree, rerouted the line up onto the bank using a combination of benchcutting and rock retaining walls, removed the organic muck, sloped the trail for good drainage, and backfilled with "gold" dirt. The old "ride around" was blocked off and the surrounding area restored. 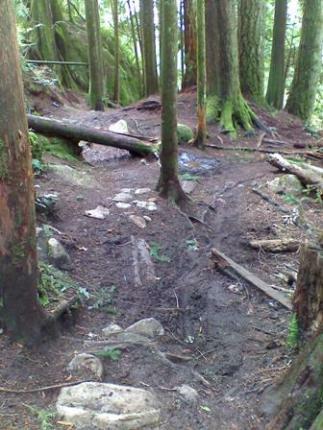 This is an example of trail design that resists erosion and minimizes our impact in the forest. Before. Swampy "ride around" in the left of the shot. After. Can you see where the swamp used to be? New line out of picture to right. Before. 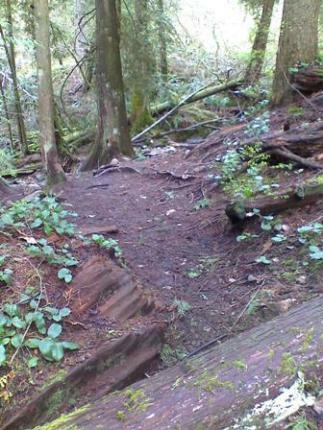 Trail cuts left around fallen tree. After. Fallen tree used to block old line. Before. View of proposed new line. After. Bench cut and backfilled. Before. 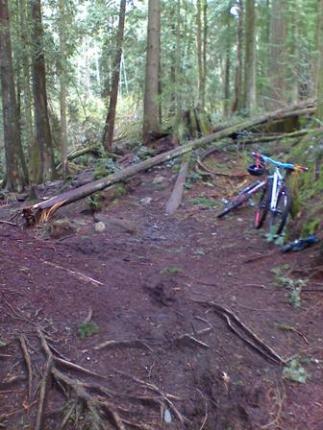 The trail is falling away down the slope and the line goes straight through the trees. After. Stone retaining wall and backfill protect the slope and direct riders away from the cedars. Before. Roots and trunks of trees are damaged. After. Large stone and fallen tree block the line, and protect the tree roots. New line out of picture to left. Volunteers spent 15 hours planning the logistics for this event. Check out our work plan attached to the bottom of this page.